Tonight in Cardiff on the big Joshua-Parker card, Alexander Povetkin scored the expected KO win over David Price. 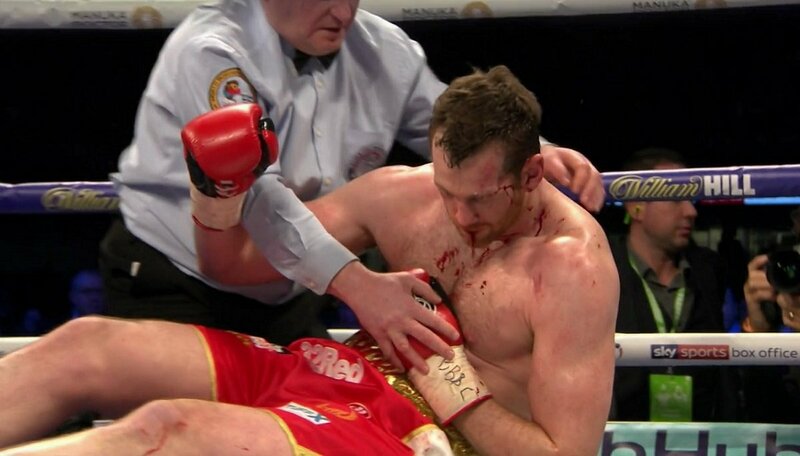 The end came, in chilling fashion, in the fifth, as a huge Povetkin right hand had Price out on his feet, before a crushing left hook that landed flush on an unprotected target sent Price down and out. The finish provided by Povetkin was as impressive as it was disturbing to watch for Price fans, but the fight had surprised many fans leading up to the finish. After a cautious start by both men in the opening two sessions, the third-round saw some terrific two-way action. Povetkin scored first, opening a cut above Price’s left eye and then knocking Price down with a crisp left hook to the head. Price was hurt, and many no doubt felt gone, but he punched the canvas in anger as soon as he went down. Then, in incredible fashion, Price returned the favour by sending Povetkin reeling with a left hook to the head of his own; with only the ropes keeping the Russian star upright. The war was on now and Price, knowing his career was on the line, was showing the kind of heart many critics have always said was lacking from the giant. The fourth-round was an even round, and now no-one knew who would win. But then, in the fifth, Povetkin unleashed a wicked right hand to the temple, the shot robbing Price of his senses, and then in came the finishing left hook that ended matters in such a violent manner. The towel was fluttering in from the Price corner at the time of the nasty KO. Price gave it a real, gutsy and honest go tonight, but it wasn’t enough and the man from Liverpool must surely now retire. At least Price can hold his head up high, knowing he really came to fight tonight. As for Povetkin, he has a number of options, including one that sees him fight Dillian Whyte next. Whyte called Povetkin out from the ringside, stating how the former WBA champ had indeed agreed to face him next. Povetkin-Price was by far the most entertaining and dramatic under-card fight on tonight’s bill.